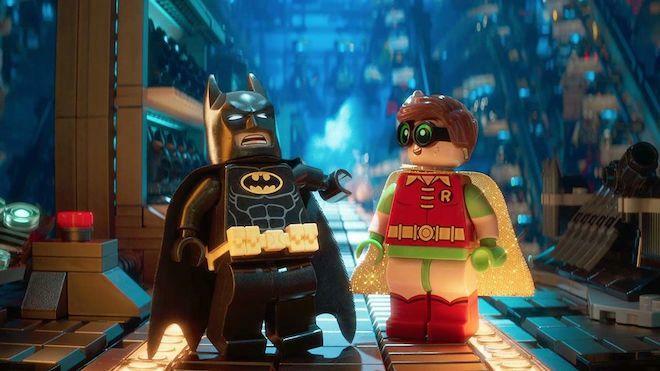 In the irreverent spirit of fun that made "The LEGO Movie" a worldwide phenomenon, the self-described leading man of that ensemble—LEGO Batman—stars in his own big-screen adventure. But there are big changes brewing in Gotham City, and if he wants to save the city from The Joker's hostile takeover, Batman may have to drop the lone vigilante thing, try to work with others and maybe, just maybe, learn to lighten up. UPDATED 6/13/17: While we were waiting for our 4K Ultra HD Blu-ray screener, we sent Bryan Kluger off to gather his thoughts on the VUDU 4K UHD streaming version of The LEGO Batman Movie, which includes Dolby Vision HDR, Dolby Atmos audio, and many of the bonus features you'll find on the impending physical media releases. We'll make sure to update this page once we get a UHD Blu-ray in for review. We have updated this review with Bryan's thoughts on the 4K Ultra HD Blu-ray. New content can be found in Vital Disc Stats, Video, Audio, Special Features, and the Final Thoughts sections of this review. Cheers & thanks for reading. The LEGO Movie was a surprise hit both financially and critically when it came out in 2014. Nobody expected it to be as good as it was, and certainly, nobody thought the breakout supporting character would be none other than Batman voiced by Will Arnett. So many people loved this version of Batman, he now has his own movie -- The LEGO Batman Movie. Made the same way as its predecessor, there is no shortage of jokes, great visual effects, and rapid-fire dialogue from start to finish. In fact, The LEGO Batman Movie is perhaps the most fun you can have with a Batman film, as it stays away from the dark, brooding tone of the live-action films and animated cartoons, and pulls a family-friendly Deadpool tone of comedy by breaking the fourth wall to make you laugh and smile from beginning to end. Don't worry, though, this movie doesn't start out with another Batman origin story. However, it does start out with a great quote from Michael Jackson read by Arnett's impressive Batman voice. The action starts right off with Batman showcasing his skills in saving the city with great ease. The one flaw about this Batman is that he's arrogant and full of himself, and is afraid to start relationships. He just wants to be the center of attention and is content with being alone. That's where the Joker (Zach Galifianakis) comes into play -- he wants Batman to acknowledge they are each other's greatest enemies. When Batman doesn't oblige, because he could care less, this prompts The Joker and the rest of the villains to hatch a scheme to bring over the worst villains ever from Superman's phantom zone. Batman must now seek help with people he knows to battle this evil, complete with voiced "pew pew" laser sounds. It's very funny. Aside from the visual spectacle and comedy, there is a good message for everyone about family and asking help from others. It's never overly preachy, but straight to the point, with style and hilarity. There are pop culture references in almost every scene in the film and if you blink, you might miss them. The voice acting from everyone is spot on, particularly from Arnett as the gruff, yet funny Batman voice and Michael Cera as Robin, who brings an added layer to this character. The LEGO Batman Movie is very funny, visually stunning, and has a good message underneath. I have no doubt this is the most fun and most you will laugh at any Batman movie to date. The LEGO Batman Movie comes with a dual-layered UHD66 Disc and a Region A locked Blu-ray Disc. There is an insert for a Digital HD copy along with two inserts for LEGO promotions. The discs are housed in am eco-friendly, hard, black plastic case with a cardboard sleeve too. EDITOR'S UPDATE 6/14/17: Unfortunately, it appears as though The LEGO Batman Movie Digital HD Copy code is NOT valid for a VUDU UHD redemption (this was the case on many Warners UHD BDs previously). Such a shame to find this out. Apologies for misleading any buyers. The UHD Blu-ray release of The LEGO Batman Movie features an HEVC H.265 encode in 2160p and a 2.40:1 aspect ratio with an impressive HDR10 / WCG grading. There is no 3D available here, though. As discussed in the VUDU UHD version (below), this overal video presentation is very good. However, during that review, I noticed some soft spots and light pixelation during the very big explosions, fireworks, and clouds in the Phantom Zone. This is completely non-existent in this physical 4K UHD copy, which was such a delight to see. Detail is ultra sharp and vivid with every tiny detail showing up and the colors are just as vibrant and strong here. Black levels are very deep and inky as well. It's just when a ton of LEGO debris is flying around or tons of fireworks going off, there is no softness or pixelation whatsoever, making this video presentation worth of 5 stars. The LEGO Batman Movie is available on Vudu's streaming service in 1080p HDX as well as 4K UHD with Dolby Vision and Dolby Atmos. I viewed the film in both formats, which are presented in 2.40:1 aspect ratio. In either form, the film looks incredible, with bright colors, fancy effects, sharp detail, and great contrast. This is perhaps the most colorful Batman film to ever be released (and, yes, I'm including Batman Forever and Batman and Robin in on that claim). On that note, let's discuss the UHD with Dolby Vision version. On one hand, streaming is a simple, quick, and easy way to get a movie in HD or 4K. On the other hand, you run the risk of clarity loss, due to buffering or internet speeds, which makes this every growing format bittersweet. I was fortunate enough to not have that problem and have top of the line internet speeds. Detail was incredibly sharp in this CGI fest, or at least as much as it could be. Being shiny, flat, plastic figures, there's only so much detail you can see, but in this case, it's very evident. Every little tiny factory line, indention, scuff mark, accent, bubble, and texture on these figures truly stand out, particularly in close-ups. It's as if they used practical LEGO figures to make the film. It's that good. Batman's cape shows the individual hard plastic threads at one point where you can literally see every piece of woven plastic. Bigger action scenes where the Bat-vehicles are traveling through the city with explosions, or fireworks, or even when we are in the cloudy Phantom Zone, the detail is sharp that we see the tiny imperfections and lines in these LEGO pieces. That being said, there is some softness in things like the bigger explosions that's not visible in the 4K Ultra HD Blu-ray. The Dolby Vision HDR and is simply fantastic and definitely the way to watch this film -- there is so much color happening all at once. The opening scene alone will show you the boost in yellow in the LEGO figure's heads as well as the different shades of red in the Batcave. Simply phenomenal. The Joker's purple and green attire definitely stands out as well. There is one scene in the film where the image turns to a Black and White image with the exception of certain primary colored objects in the background. This scene truly shows just how well the Dolby Vision handles contrast while these primary colors pop through the Black and White screen (it's almost 3D.) Black levels are consistently deep and inky with zero crush, which was great because there are dark moments in the film, as well as Batman's outfit. Needless to say, this was a top of the line streaming video service experience. By comparison, the VUDU HDX (SDR, 1080p) version also looks excellent, specifically when detail is concerned -- I still noticed the tiny imperfections and textures in all of the LEGO pieces here, while is still smooth in all lighting conditions -- but the main difference is in colors and contrast. Even though the HDX 1080p HD version pops, that Dolby Vision truly brings it to another level. At the Fortress of Solitude, the HDX version presents blues and whites as two standard colors, but with the Dolby Vision, you can clearly see the many shades of blue and white in that icy world. The same goes for Robin's green eyeglasses -- in the HDX version, they shine brightly, however in UHD, you can actually see different shades of green flying around. HDX black levels are still deep and inky here too, but with a good uptick in color and improved contrast, the VUDU UHD & 4K Ultra HD Blu-rays offer dramatic improvements. Much like the VUDU UHD version (see below), the UHD Blu-ray also boasts a fantastic Dolby Atmos soundtrack. For implimentation purposes, the UHD Blu-ray uses the lossless Dolby TrueHD codec, while the VUDU UHD utilizes Dolby Digital Plus. Despite this, there were no differences in the sound quality between the two that I noticed. Every sound effect is robust, loud, and has great directionality. There is so much going on with this audio track, both in the front and in the background that it could be easy for certain elements to get lost. That's not the case with this amazing Dolby Atmos track. Every sound effect, ambient noise, and piece of dialogue is nuanced and detailed and given the right amount of balance to make everything sound as natural as it could be. The bass packs a punch in every corner and the music always adds to the entertainment value in each scene. What a phenomenal audio presentation for sure. 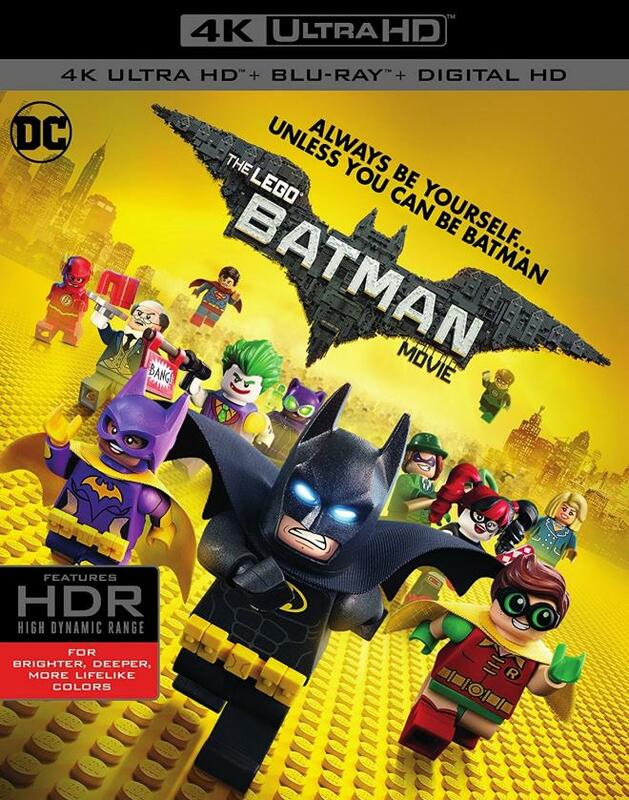 Vudu offers a Dolby Atmos track for its digital UHD release of The LEGO Batman Movie and a Dolby Digital Plus 5.1 mix for the HDX option. Again, I had the opportunity to listen to both and of course, the Dolby Atmos version is definitely the more immersive track. Like complex visuals, this dynamic audio presentation's dialogue, sound effects, and score barely give the audience a chance to breathe. This is a fully immersive Dolby Atmos track that puts you in the center of all the comedy, chaos, and fast-paced action, right from the very start of the film. Sound effects are booming and robust and have great directionality. Helicopters flying overhead, automated machines in the Batcave, and vehicles flying by all sound impressive with a great low end of bass that never crosses into rocky territory. Speaking of flying overhead, this Dolby Atmos mix definitely captures those overhead sounds nicely as it moves across the speakers, making you look up quite often. There is a particular scene where Batman is eating food alone the big vastness of his Batcave. Every time he chomps down on his food, it echoes on top of you and behind you, just as if you were in a giant cavernous space. It's an aural delight. Other ambient noises -- people screaming, working, talking, or yelling the gun blast sound of "pew pew" -- come through nicely in the surrounds as well. The pop score and fun songs always bring a sense of comedy and nostalgia with them and fully engulfs the audio track while not drowning out any other sound aspect. Dialogue is crystal clear and easy to follow at all times, even when it's rapid fire, which is pretty much on a consistent basis. There were no signs of any audio issues at all, however, I'm curious to hear how the hard copy of the UHD will compare to this great sounding film. In comparing the Dolby Atmos with the Dolby Digital Plus 5.1 mix, well, there is no comparison. The 5.1 sounds great for sure, but it's a basic mix without the real fluid motion of overhead sounds or top notch layered effects. That same scene where Batman is eating alone in the big Batcave doesn't sound as good or as full with the right dynamics in play with the 5.1 mix. The low end is still good and dialogue is clear and easy to follow along with, but it's more of a paint by number scenario. The LEGO Batman Movie deserves the best sound on the market, and that is Dolby Atmos in this case. Audio Commentary- Director Chris McKay and several of the other crew members who helped make this film talk about making the film. It's an engaging and fun commentary where they discuss the screenplay, the voice casting, what LEGO did and didn't like about the film, and how the story came to be. It's a great listen. Animated Shorts (HD, 13 Mins.) - There are 5 animated shorts here that are all funny and worth watching. Cooking with Alfred was great and the LEGO characters doing Foley sound work for the film was also hilarious. There is also the 5 minute long Ninjago Short here too. Deleted Scenes (HD, 7 Mins.) - Four deleted scenes in total here that are unfinished, but are worth watching. Edited out for time, most likely. One Brick at a Time: Making The LEGO Batman Movie (HD, 16 Mins.) - The crew and voice actors talk about making the film, how the movie looks, the tone, humor, references, and their love of the Batman universe. It's a fun watch. Rebrick Contest Winners (HD, 3 Mins.) - Will Arnett hosts the top three fan-made LEGO Batman shorts here, which was some contest before the film debuted. Inside Wayne Manor (HD, 3 Mins.) - A comedic tour by Batman/Bruce Wayne around his giant house. Brick by Brick: Making LEGO Batman (HD, 4 Mins.) - The cast talks about their voice acting work on the film along with footage of them recording their lines in character. Behind the Brick (HD, 4 Mins.) - The LEGO figurines in character talk about making the movie and working with each other. Pretty funny. Me and My Mini Fig (HD, 1 Min.) - The three main actors have fun with their LEGO figures on camera. Trailers (HD, 30 Mins.) - There are 10 trailers for the film here, a few of which are gimmicky, including a 4-minute ComicCon panel in LEGO form. Gallery (HD) - A total of 23 images from the film are here for you to look at. Clips (HD) - There are 8 clips from the film that you can watch and share with your friends on social media. The LEGO Batman Movie is such a fun film. It literally is the Deadpool for people of all ages. It's action-packed, hilarious, thrilling, and has a good message, and is not afraid to break the 4th wall throughout. This is one of the best Batman films in the history of Batman. The video and audio presentations are both fantastic with the video being a slight uptick from the VUDU UHD streaming version. The extras are all worth watching, and the added commentary track is quite fun. However, it would have been fun to have a Batman-in-character commentary track here. This 4K Ultra HD Blu-ray is Highly Recommended for everyone!